What sort of trick question is this? Are you hinting that my knowledge of ant biology is getting a bit rusty? Ants engaging in silk weaving or slavery are a reminder of their sophistication, whilst if you are looking for a frisson of horror then consider the relentless march of the nomadic army ants, using their bodies to build bridges across water or filling pits to enable the horde to move on along its destructive path. More benignly the fact that ants are past-masters of devising mutualisms is hardly news. Making friends with fungi (and other symbiotic associations with bacteria) leaf-cutter ants construct subterranean farms that have uncanny similarities to human agriculture. And then of course many times independently ants have learnt to harvest the honeydew from the bottoms of aphids and other hemipterans while at the opposite ends they thrust their stylets deep into the plant to tap the sugar-rich fluids flowing through the phloem. Farming and harvesting may be one thing, but ant shepherds guiding their flocks that they may safely graze? Why this is as silly as suggesting insects can use tools. Sorry to disappoint you! In the tropical forests of south-east Asia numerous species of an ant (Dolichoderus) and a mealybug (a relative of the aphids) have formed an extraordinary symbiotic partnership, obligate in the sense that either insect is entirely dependent on the other. The deal goes as follows. The mealybug produces the honeydew, but the ant requires the best quality food so the mealybug will only drill into youngest parts of the plant with the best nutrient value. The rainforest is a rich mosaic of many plant species so the mealybug is also remarkably catholic as to the range of plants it can exploit, including not only many flowering plants but even ferns. So the ant gets a good deal, but the patchiness of the resources means that they have to be constantly moving their mealybug charges to pastures new. Not with the aid of dogs and whistles, but by carefully picking up the mealybug in its jaws (although in one species the mealybug hops on the back for the ride). And if it starts to rain? The ants quickly form a waterproof roof. But in the nest (which is a so-called bivouac and made entirely of living ants) the mealybugs also find shelter, and significantly it is packed with gravid females. Sounds like the National Health Service. Mutualisms like our ant shepherds provide the essential counterpoint to the grim view that evolution is nothing but competition, a world drenched in gore and riven with the shrieks of the doomed. Predation is for real and arms races drive evolution, but so do reciprocation and the common good. Our world would not have emerged without the former nor exist without the latter. Another example of an ant-aphid association is instructive in this context. Here the aphids are subterranean, drawing sustenance from the plant roots. Recall how the noxious phylloxera that swept through the European vineyards in the nineteenth century had as its root cause attacks by a close relative of the aphids. Now in this other ant-aphid mutualism both sides still benefit. 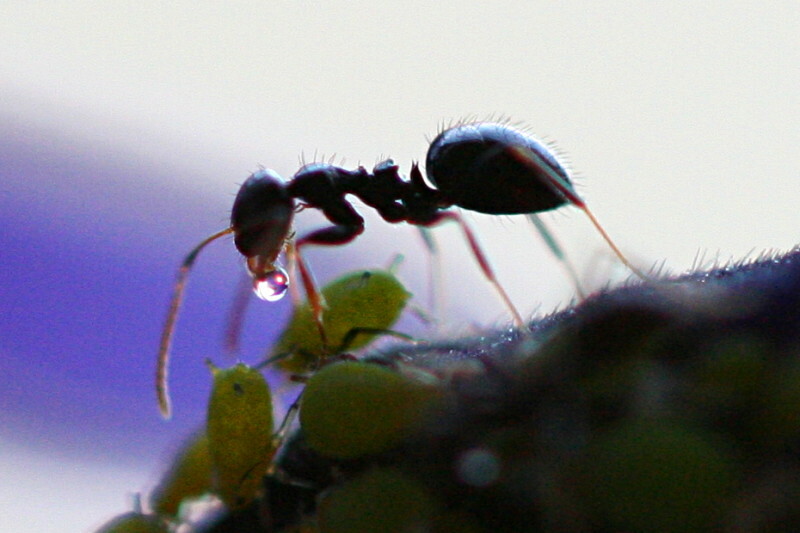 The ants harvest the honeydew and help to provide the best feeding conditions for their associates. All very agreeable, but there is a much darker side. This is because the ants also consume the great majority of the young aphids (the nymphs) and only a few adults are maintained. It is not so different from cattle husbandry whereby the ants obtain the best of both worlds in the form of an equivalent of milk (the honeydew) and steaks; aphid-burgers, anyone? Tough on the “cows” but without this ant husbandry there wouldn’t be any “cows” at all, would there? Dill, M. et al. (2002)  Herdsman ants and their mealybug partners. Abhandlungen der Senckenbergischen Naturforschenden Gesellschaft 557, 1-373. Ivens, A.B. et al. (2012)  Ants farm subterranean aphids mostly in single clone groups – an example of prudent husbandry for carbohydrates and proteins? BMC Evolutionary Biology 12, e106. Maschwitz, U. and Hänel, U. (1985)  The migrating herdsman Dolichoderus (Diabolus) cuspidatus: an ant with a novel mode of life. Behavioural Ecology and Sociobiology 17, 171-184.